When it comes to roofing in Bloomington IN, we believe in offering only the best. This is why we work only with the most reputable brands in the roofing industry, ensuring that every product you receive will be of quality and capable of addressing your roofing needs. GAF’s Master Elite certification program only accepts contractors that are properly licensed and adequately insured, have a proven reputation, and are committed to ongoing professional training. However, just because a contractor is invited into the Master Elite program doesn’t mean that they’re automatically certified! Many will move on, choosing to pursue certification, but not all will be able to make it. In fact, just 3% of all roofing contractors will be able to distinguish themselves as Master Elites. 1. GAF is the largest shingle roofing manufacturer in North America and you don’t get to that level without a focus on quality. This means GAF roofing products will be some of the most reliable you’ll ever find on the market, withstanding not just the harsh weather but also giving your property an aesthetic boost. 2. GAF only chooses reputable contractors to become Master Elites. With our certification, we only offer excellent roofing products and services. 3. All GAF roofing products come with warranties. However, if you receive roofing from a Master Elite contractor, you gain access to better coverage, thanks to the System Plus and Golden Pledge warranties. Think 50 years of coverage against material defects and up to 25 years of coverage for installation work and other roofing components. 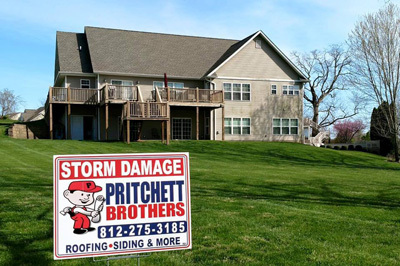 We are open from Mondays to Fridays, 8 am to 4 pm To learn more about our roofing products and services, just give us a call at (812) 275-3185. We offer free roofing inspections. Looking for financing options? Don’t hesitate to talk to us about flexible choices available from GreenSky.